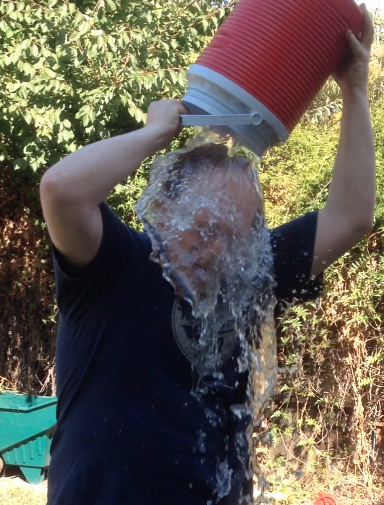 I was challenged to do the Ice Bucket Challenge by Roman Reed. I did it yesterday and can see it was mighty cold! Total shock, but fun. It sure wakes you up. Yeah, we have a drought but I did the big splash with tons of ice. I did the challenge in honor of patients with ALS and the ALS Foundation, patients with Spinal Muscle Atrophy (SMA) and the Gwendolyn Strong Foundation, and the St. Baldrick’s Foundation for children’s cancer research. I’ve already given to St. Baldrick’s and shaved my head this year for the third year in a row. I’ll be giving donations to the ALS and Gwendolyn Strong Foundations. Please consider giving as well. In my video (below) I challenge Robert Lanza of Advanced Cell Technology (ACT) to do the challenge too. What do you say, Bob? Great job, Brother! We fight on for Cures! It was! Brr. I thought it was going to be no big deal, but the water temp was probably approaching 4 degrees. Probably added a lot more ice than most folks. I had this notion I’d say a few more words afterwards, but I was speechless for a while there. It was fun though! I hope you’ll accept the challenge, my friend, and if you do I’d be happy to post it on my blog unless you want to put it up on YouTube. In turn might I respectfully suggest that you then challenge Francis Collins? thanks for such an important and intersting sharing.